Hurry -- Special Introductory Offer Ends Soon! 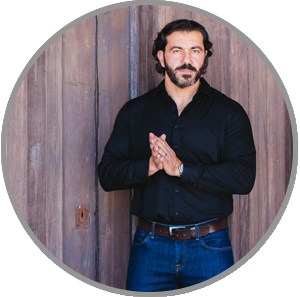 I'm talking about how close you are to achieving breakthrough success. The kind of success that transforms your bank account and gives you the freedom you want in life. But, for some reason that level of success stays just out of reach, even though you're showing up and grinding every day, sometimes seven days a week. Well, I've been there, too. And I know how frustrating it can be. Imagine how it will feel to have big leaps in your career... instead of spinning your wheels in a job that frustrates you. Imagine what it will be like to grow your income and beef up your savings, allowing you to have more time with your family, and to see the world... instead of only dreaming about it. Imagine you and your family enjoying the peace and security of financial freedom... instead of living another year backed against the wall by bills, taxes, student loans, and credit card debt. Like I said... exciting! And best of all, you don't have to just imagine. Because as incredible as it may sound right now, you really can achieve that kind of breakthrough success. It may not happen overnight. But it will happen. Probably much faster than you think! Do you ever wonder why some people achieve amazing success, while others who are just as talented and hardworking struggle to get by? Do you put in long hours of hard work only to go home feeling burned out, overworked, and underpaid? Do you feel rushed and behind schedule? And even though you hustle, do you feel like days, weeks, and months fly by while nothing in your life changes? Well, the good news is, after coaching thousands of men and women — from office workers and young professionals to busy moms and dads to some of the world's most successful entrepreneurs — I've found that the difference between mediocrity and MASSIVE success is often just one small thing. In fact, in my 17 years of coaching, the most dramatic changes have occurred when my clients do this one thing. ... And I've even helped the CEO of a $100 million dollar software business do it to get more work done in the first 2 hours of his day than he used to get done in a typical 8-hour work day. You'll hear more of these amazing success stories in just a minute. But first, you're probably wondering what is this one thing that can do so much for your success? Now before you roll your eyes, hear me out. Because I bet you've heard a lot about morning routines lately. You've heard about morning routines on podcasts and blogs, in books and magazines. It seems like everyone is talking about them these days. Heck, you may have even tried doing a morning routine yourself in the past. And if you're like most people your results were average. At best. But keep reading! Because what I'm going to share with you about morning routines is different. You'll discover why you don't need to crawl out of bed at 5:00 A.M. to have an effective morning routine. You'll discover how a personalized morning routine is the secret to automatic productivity. And you'll discover that you, too, can use a morning routine to take control of your life — and enjoy far greater income, freedom, and success as a result. 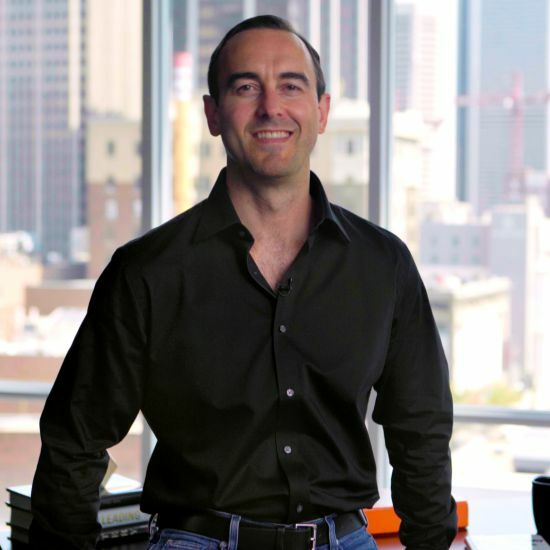 Hi, I'm Craig Ballantyne, author of The Perfect Day Formula and owner of the world-famous success newsletter Early To Rise. As a busy writer, speaker, and business owner who travels at least 150 days every year for work, I am obsessed with productivity. Because I've learned that in life and business, what makes the difference between success and failure isn't putting in more time, it's getting more results out of the time you DO put in. Thanks to my ability to be productive and generate massive results I was a self-made millionaire before my 30th birthday. But don't get me wrong: I am NOT especially gifted, smart, or hardworking. In fact, I used to be lazy and unmotivated. So why have I been able to achieve an uncommon level of success? Well, the biggest reason is because I found a unique way to master my mornings. After years of research — and investing over $300,000 of my own money to learn from elite super-achievers like Tim Ferriss, Mark Cuban, and Anthony Robbins — I crafted and refined an amazing morning routine that makes productivity automatic and success practically inevitable. Nothing has contributed more to my success than this powerful morning routine. And I refuse to keep it to myself. 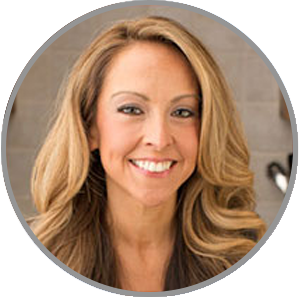 You see, at Early To Rise, our mission is to help success-minded men and women get healthy, make more money, and have more time for what really matters in life. And that's why I'm thrilled to let you be one of the first to hear about a brand new program I've developed called The Millionaire Morning Routine. The Millionaire Morning Routine reveals the exact system I use to get more done before lunch than most people get done all day. And now it can do the same for you. Finally... a New and Improved Approach to Morning Routines! Most morning routines ask you to do too much. You've got to meditate and exercise and journal and do affirmations and try to squeeze a half dozen other activities into your busy schedule before breakfast. Do you have time for all that? Of course not! And that's why The Millionaire Morning Routine asks you to do less. By focusing on the right goals for your life (which I'll help you identify in the program) you'll achieve bigger, faster results with less effort. Another problem with most morning routines is they're too darn demanding! You've got to drag yourself out of bed at 5:00 A.M or some other unholy hour. Now, if you're naturally a morning person and you want to get up that early, fine. But with The Millionaire Morning Routine you choose a wake-up time that's right for you. In fact, if you can manage to get up just 15 minutes earlier tomorrow morning, then I'll show you how to take charge of your life and start making noticeable progress on your most important goals. That's a promise. So as you can see, The Millionaire Morning Routine is NOT like other programs you may have seen or tried in the past. It's personalized for your challenges and opportunities. So you can overcome obstacles and make progress on what matters most to you. And that's why I'm confident The Millionaire Morning Routine will help you achieve the breakthrough success you desire and deserve. Just like it's done for me and so many of my clients. "Using this success system made the rest of the day flow much better. I never got to the end of the day feeling like I hadn't accomplished anything. This helped me get more done and make more money. 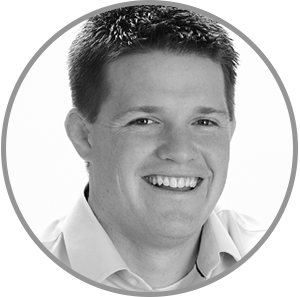 The principles you'll learn in Craig's system are essential for every busy entrepreneur, as well as any busy parent who wants to feel accomplished each day. Craig, I am truly grateful for your work. It has not only changed my life, but the lives of my children as well." "The two main things that have helped me the most were getting up at the same time every day and working on the most important thing. That alone has helped me tremendously. It has helped me deal with adversity (hours got cut at my old job) where I was able to overcome an obstacle and use it as a positive. When my hours got cut back I went to several companies preaching my passion and it finally got me the job where I am at now! It was a blessing in disguise when my hours got cut." "Before meeting Craig, my biggest struggle was controlling my mornings. That led to a constant feeling of being rushed and falling behind schedule... which in turn led to anxiety throughout the day. The #1 lesson I learned from this program was how to dominate my mornings by blocking off my Magic Time and scripting the first three hours of my morning the night before. These days I have my to-do list knocked out by 10:00 a.m. This helped me overcome afternoon anxiety, regain control of my day, and free up more time in the evening to have with my family rather than playing catch up. I no longer have to work in the evenings and I get 7 hours of sleep per night rather than 4-5 hours in the past. Making a lot of money is great, but having the freedom to enjoy it without being stressed or anxious is the true definition of happiness. Craig's Millionaire Morning Routine is for anyone who is driven to succeed but always seems to run out of time, misses deadlines, or lives in a state of anxiety. It will change your life." "Thanks to what I've learned from Craig, now in my '2-hour mornings' I get as much work done as I typically do in an 8-hour day. I've already moved things before my kids are awake, and now the rest of the day is just a bonus. I hope that you try it. You'll get 10 times more stuff done." YES! Get my Millionaire Morning Routine Started! You, too, can achieve breakthrough success at work and home, in your health and personal life. And you can do it WITHOUT working harder or putting in more hours. Because remember, the difference between mediocrity and MASSIVE success isn't putting in more time. The difference is getting bigger results out of the time you DO put in. And with The Millionaire Morning Routine you'll discover exactly how to do that. The secret to automatic productivity the minute you jump out of bed — even if you're not a "morning person". The world's simplest productivity secret. Just do this one thing and you'll be delighted by how much you accomplish before lunch. The big mistake most people make when they try to start a morning routine. Doing this seems like a good idea. But if you make this mistake it will tank your productivity. How to supercharge your body's energy levels — without caffeine or supplements. One specific step is all it takes. How to set yourself up for future success by getting quick wins now. The real reason most people fail to achieve their goals. It's not because they lack talent or ambition. It's a lack of something that's easy to cultivate and requires no special talent or ability. The "brain dump" method that lets you leave work for the day feeling focused and refreshed. Simple and relaxing... and it dramatically boosts your productivity, too! How to avoid the common goal-setting trap that destroys your results. Avoid this common morning habit like the plague if you want to take charge of your life and start achieving big wins. How to quickly build momentum and smash through the obstacles that have always tripped you up in the past. How to get what you really want by doing less. And there's much more. But just imagine the impact that even one of the above insights could have on your career, your finances, your family, or your life. Starting today, you'll receive a Program Overview and the Week 1 "Perfect Morning Routine" manual. When your "Perfect Morning Routine" manual arrives in your inbox, open it. Inside this manual you'll find five video lessons and instructions for the next five days. I recommend watching one video lesson per day. That way you won't feel overwhelmed or get slowed down by "analysis paralysis". Instead, all you need to do is watch that day's video lesson. And then do the action steps in your "Perfect Morning Routine" manual. You'll receive your Week 2 manual at the start of the second week of the program. And you'll receive your Week 3 manual at the start of the third. In all, it will take you three weeks to complete The Millionaire Morning Routine. You'll soon be in control of your mornings and your life. You'll start making real progress on your most important goals. And you'll create more opportunities and success for yourself and your family than you ever have before. The sooner you get started, the sooner you'll reap the benefits of your own millionaire morning routine. You can put The Millionaire Morning Routine to work for you right now. It's yours today for a very special introductory price. Instead of the regular $97 price, for a limited time it can be yours for only $27. Yes, The Millionaire Morning Routine is priced low. In fact, it only costs about what you'd expect to spend on a pair of movie tickets. But don't let the program's low price fool you. Because what awaits you in The Millionaire Morning Routine has the potential to upgrade every aspect of your life. And that's one reason for the program's very reasonable price. You see, if you're willing to put in the work, then I know The Millionaire Morning Routine is going to help you overcome what's holding you back so you can achieve extraordinary results. And I don't want to let anything, especially not price, stop you from taking action now to get the results you desire and deserve. That's why we're offering The Millionaire Morning Routine at a price anyone who's serious about their success can afford. Watch, enjoy, and benefit from The Millionaire Morning Routine for 60 days. If, during those two months, you don't feel you've received at least 100X the value of your $27 investment... if you're not getting more done than you ever thought possible... if your family, friends, and business associates aren't stunned by your newfound ability to plow through obstacles and achieve your goals... all you have to do is email us or call us at 1-800-965-4172. You'll receive a prompt and courteous refund of every penny of your purchase. No questions asked. No hard feelings. In other words, you risk nothing at all when you try The Millionaire Morning Routine today. Because I'm that sure of the life-changing potential of this amazing program. You can do nothing and 6 months from now your life will probably look about like it does today. You'll be up against the same challenges; and you'll be getting the same results. Or, you can take a chance on The Millionaire Morning Routine and 6 months from now your life could be very different. You might not quit your job... but you could start a side hustle that will eventually replace and surpass your full-time salary. You might not run an ultramarathon... but you could get in much better shape and lose your potbelly or get your pre-pregnancy body back. You might not make a million dollars... but you could negotiate a big raise or start a business and become a millionaire in the next ten years (or even sooner). Take any one of your goals, not matter how ambitious or scary it may seem, and think about how much you could improve your chances of achieving such an ambitious goal if you were making forward progress on it every single day. Let The Millionaire Morning Routine show you how to develop a powerful morning routine that will set you up to generate huge financial rewards, advance your career, deepen your relationships, and bring you more (much more) success in every area of life. I promise this will be the best $27 investment you make all year — considering the results you'll achieve by following this simple program. As soon as you order, you'll receive immediate access to your Week 1 "Perfect Morning Routine" manual. Inside, you'll find your first 5 video lessons and action steps. Then, you'll receive two more manuals and 10 more videos over the next few weeks. That's three manuals and 15 video lessons total. And each one gives you a tool you need to build a morning routine that transforms you into a highly-productive super-achiever. And remember, you're protected by our 60-Day 100X Guarantee so you risk absolutely nothing when you order now. Because The Millionaire Morning Routine won't be available at the special introductory price of $27 much longer. So click or tap the button below to make sure you get the best deal on this amazing program... and finally achieve YOUR breakthrough success! P.S. — If you're the kind of person I think you are, you're not looking for a "get rich quick" scheme. You're not looking for a winning lottery ticket or a goose that lays golden eggs. You know success is earned. And you're willing to put in the hard work to get results. The problem is, you're already working hard but you're not making forward progress. Well, that's where The Millionaire Morning Routine has the potential to change your life. Because with this program you'll identify the hidden roadblocks slowing you down. So you can blast through them and start accomplishing more before lunch than you usually do all day — guaranteed. Imagine getting 3x... 5x... or even 10x the results you're getting right now from the same amount of effort! With The Millionaire Morning Routine it's possible. And because you're protected by our 60-Day 100X Guarantee you risk absolutely nothing when you give The Millionaire Morning Routine a try today. Then click or tap the button below to get started today, RISK FREE. "I used to think that if I got up and worked hard that I would achieve my goals and live my dreams. I thought hard work was the secret ingredient, but after years of that approach I found I was making slow progress at a very high emotional cost. The #1 lesson Craig taught me was to be strategic, and to align my hard work with my vision and with my guiding principles in life. Success is not a happy accident. It is a strategic process. Now I guard my Magic Time and say "No" to distractions. I am living the life I used to dream about. Every day I get to wake up and help others achieve their goals while earning my freedom. Thanks to Craig's formula, I've increased my income and traveled the world, checking off Bucket Item lists like buying a motorcycle, hiking the Scottish Highlands, living in Paris for weeks, and flying to New York City for the weekend to see U2 in concert... It's led to so many priceless memories in such a short time, I cannot wait to see what the next few years bring!" "Craig, I have to tell you that since I started reading my own rules and my "not to do" list in the morning, I have found myself NEEDING to do it every morning. I literally feel compelled to do it which I have to say is new for me. Getting your program is one of the best things that I have done for myself in a very long time. All I can say is thanks!" "Back in the day I'd work all the time and try to do everything. I was frustrated. I was always chasing my tail but wasn't getting my most meaningful work done. Craig taught me that structure brings freedom and is crucial for my productivity and happiness. I now get far more done in 4-6 hours than I did when I was working 12-16 hours a day. I'm happier, more financially successful and have the time to do more of the things I love. Craig's advice has added at least $300,000 per year to my bottom line." "You'd think that my crazy work schedule (I'm an actor) and my two year old make it nearly impossible to go to bed and wake up at the same time every day, but I don't let that stop me. My productivity and confidence has improved so much since I received the program. The best result has been the sense of accomplishment I feel at the end of the day, rather than having a feeling like I could have done more." "I run a 7 figure advertising agency. After digging into your program I saw what I needed to change about my routine to get more done in less time. I now wake up 30 minutes earlier than I used to and get twice as much done before lunch with half the stress, and sometimes no stress at all. I write first thing in the morning before my wife and daughter wake up. Then I eat breakfast and write for another 90 minutes. This way, I produced a 10,000 word content piece for my business in just a week while launching 2 new offers! Your program promises to teach us how to get through your to do list and be home in time for dinner. It did exactly that for me." 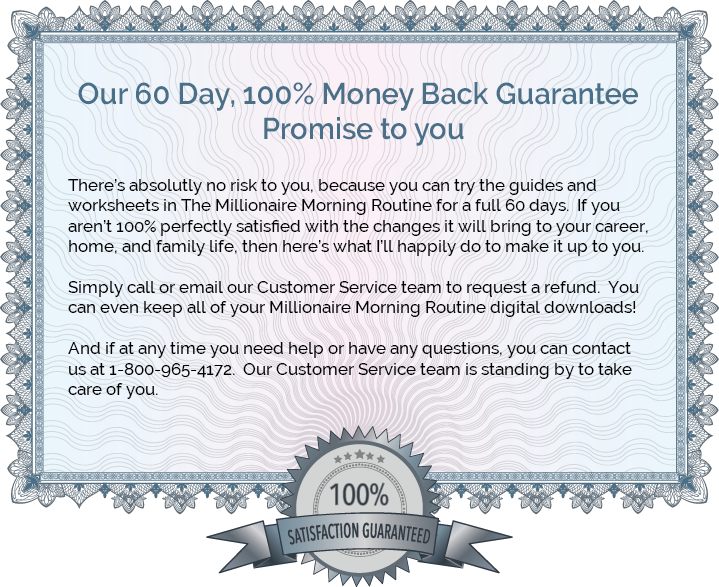 There’s absolutly no risk to you, because you can try the guides and worksheets in The Millionaire Morning Routine for a full 60 days. If you aren’t 100% perfectly satisfied with the changes it will bring to your career, home, and family life, then here’s what I’ll happily do to make it up to you. You can try The Millionaire Morning Routine for a full 60 days. If you are not totally satisfied at any time during those 60-days, just let us know at support@earlytorise.com and we'll gladly refund you.